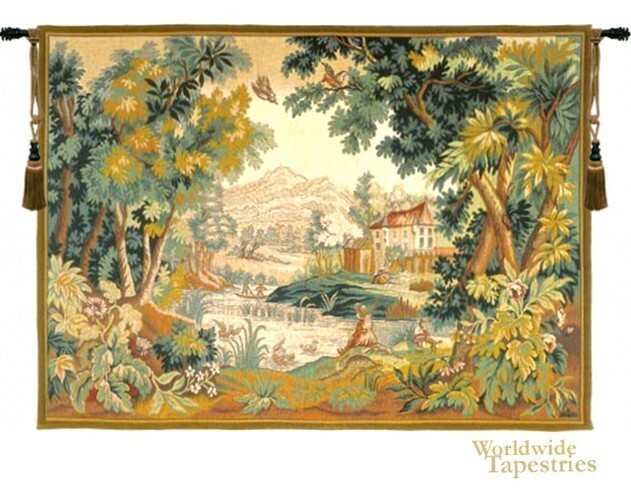 This tapestry, 'Paysage du Lauragais', meaning 'Landscape of Lauragais', an area in the South of France near Toulouse, represents a typical verdure tapestry from the 18th century. Lauragais is renowned for its fertility of soil and growth of the pastel plant. In this tapestry we see a scene in the countryside in autumn colors of greens, golds and browns with the typical attention to detail in the leaves and foliage, as well as a girl enjoying a day on the river. This tapestry features the elements that have been popular in the 18th century as a part of the verdure style of tapestries, namely a variety of foliage types and trees to provide focus to the foreground and more distant hills for the background. This tapestry is backed with lining and has a tunnel for easy hanging. Note: tapestry rod and tassels, where pictured, are purchased separately. Dimensions: W 72" x H 50"